Buy Blue Flag Iris For Sale Online. Wholesale Prices. Blue Flag Iris, or Iris versicolor as it is also known, is a perennial plant found all over in the Eastern United States and Canada. It is commonly found running along marshes, stream banks, and lake shores. These flowers are known for their bold, colorful violet-blue flowers deeply veined sword-like leaves. The flowers themselves are two to three inches tall with white markings by the base. Blue Flag Iris can grow up to three feet tall and two feet wide. They do best in moist, wet, well-drained soil. This plant prefers partial shade for maximum growth. They are often used as a focal point in a small pond as the color and height will draw your eye to the lake or garden where it is planted. They have the bonus of attracting hummingbirds and are largely deer resistant. Landscapers use these bold-color plants to add pops of color to any landscape project. The Blue Flag Iris grows in zones two to seven comfortably. For the best results possible, you should plant your Blue Flag Iris plants 10 to 12 inches apart to give them room to spread out. This perennial grows at a medium rate, with an average span of 10 years. The plant’s flowers make the perfect addition to a cut flower bouquet. These plants do require little maintenance. They should be cut back in the fall to ensure healthy growth in the spring, and make sure they have moist soil. 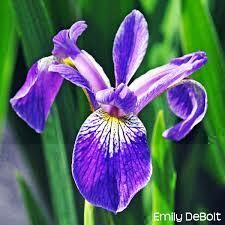 The Blue Flag Iris blooms in late spring and continues to thrive into mid-summer. Blue Flag Iris is a gorgeous addition to any garden or project. They are suitable for beginners as they are easy to care for and maintain. These beautiful plants are shipped to the consumer in their bare root form, so they arrive in top notch condition Blue Flag Iris.